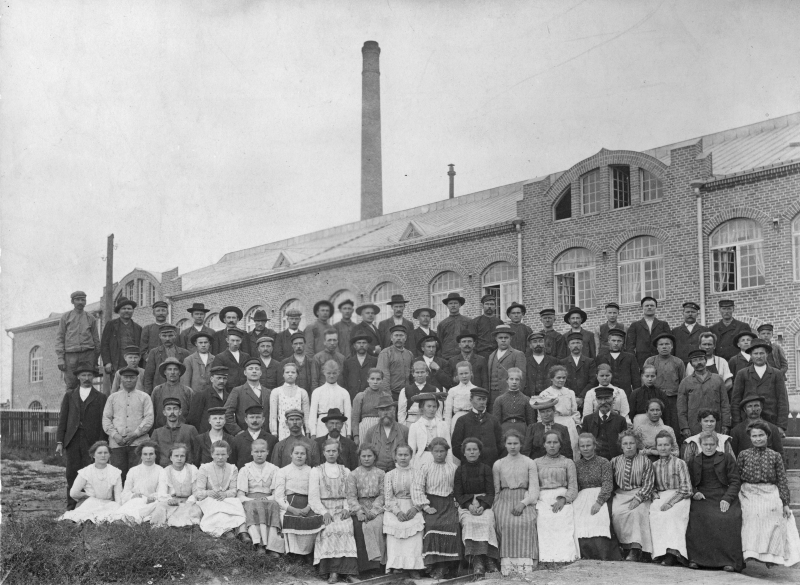 Gummitehdas workers in front of the factory in 1907. Technical Director Antti Antero is sixth from the right in the second row. 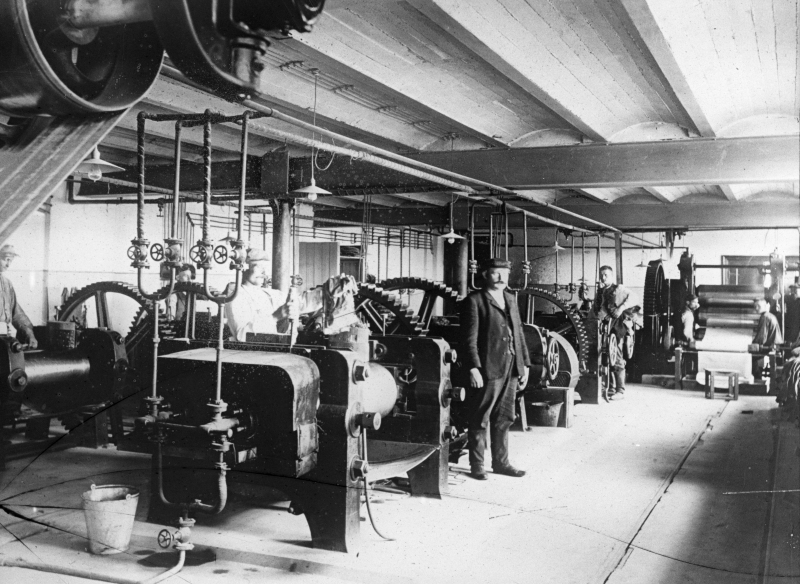 Mixing department in the 1920s. 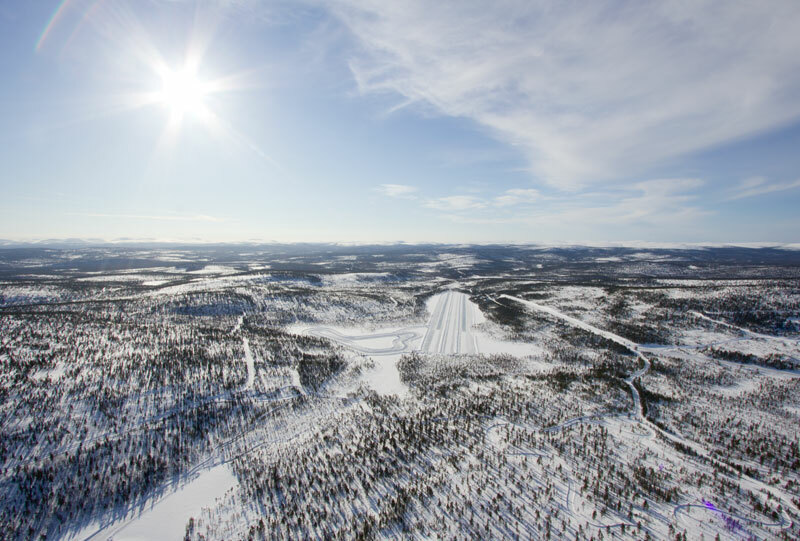 Kelirengas – The world’s first winter tyre. 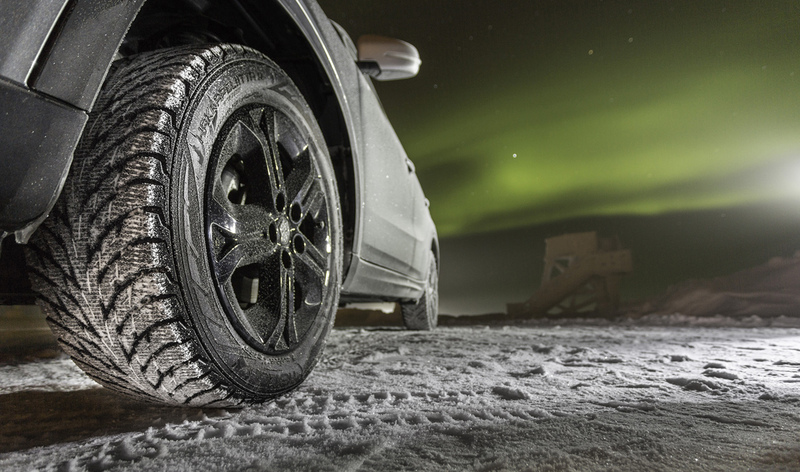 It was mainly designed to keep the vehicle on the road under soft and snowy conditions. 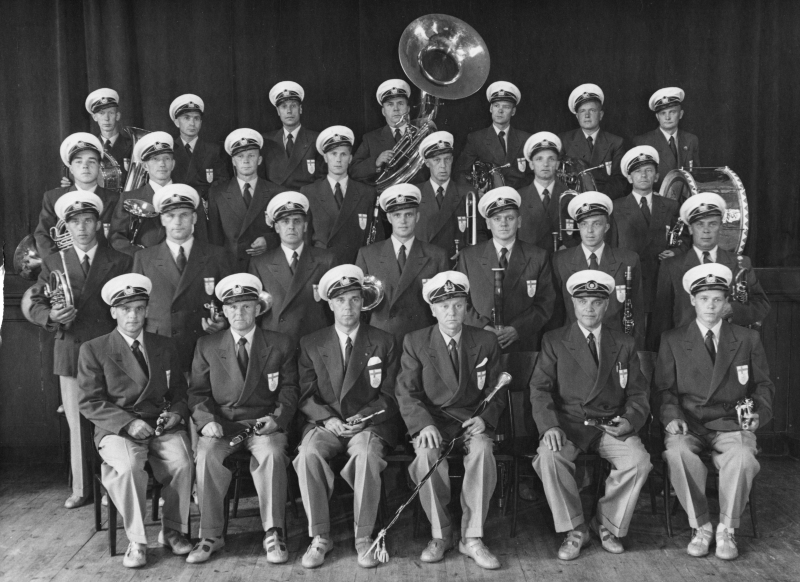 The company band toured Finland, gathering information concerning the customers’ wishes at the same time. 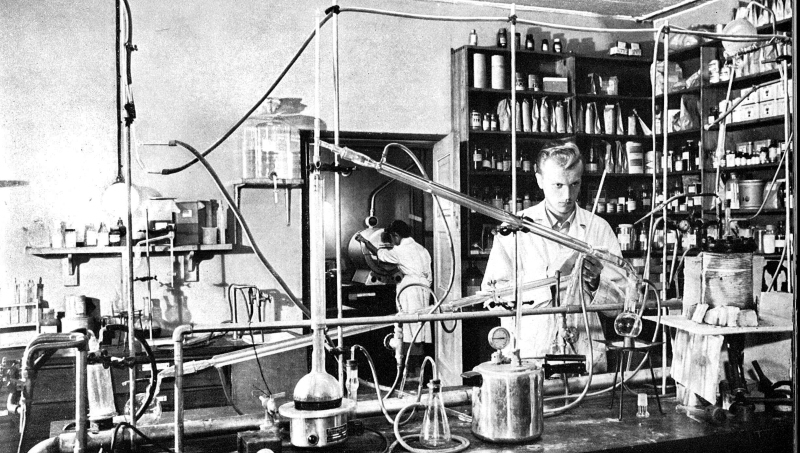 Researchers at work in the factory laboratory in Nokia. 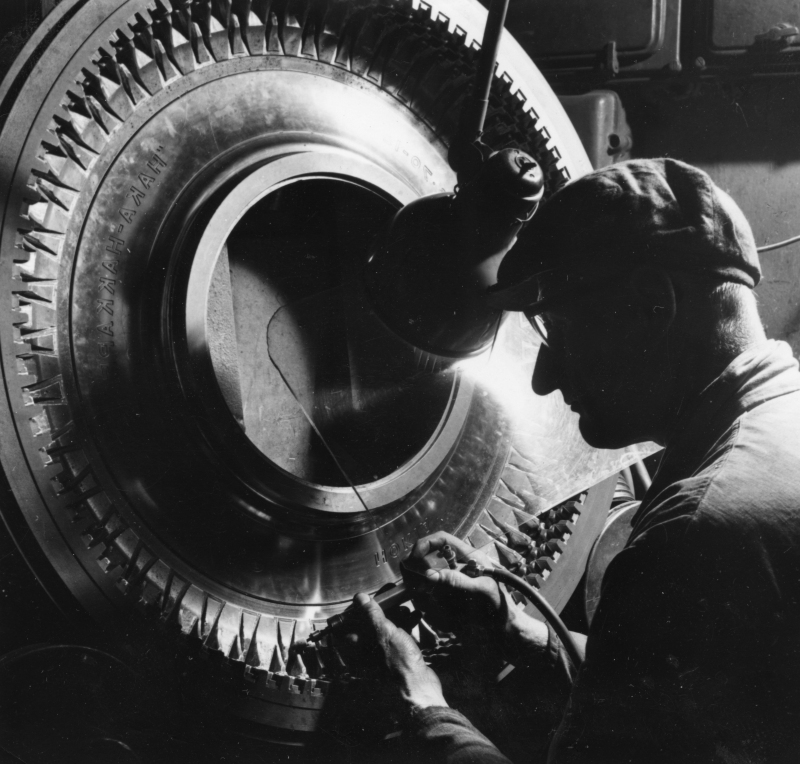 Treading in 1946. Pekka Vilma operating the machine. 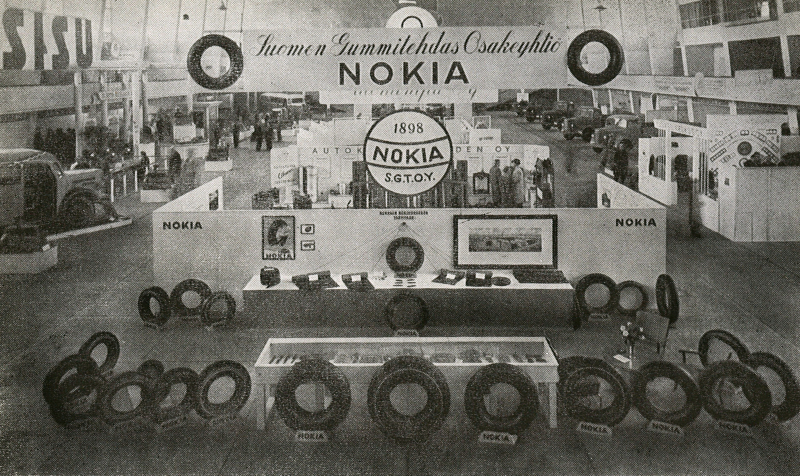 Suomen Gummitehdas's tyre exhibition at Helsinki Exhibition Centre in 1946. 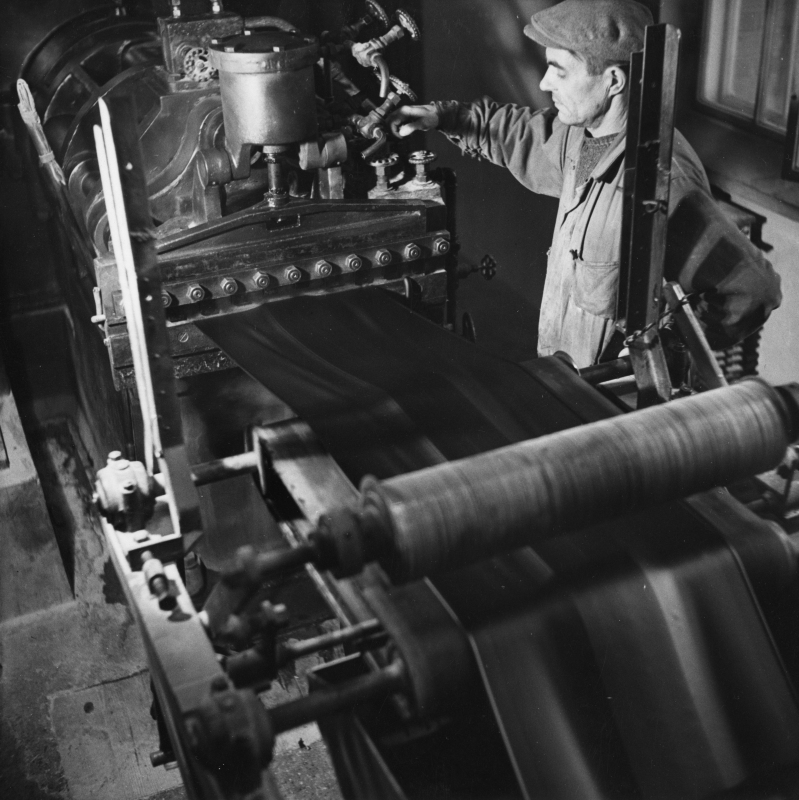 An engraver finishing the mould for a Haka-Hakkapeliitta at the end of the 1950s. Green tyres at new radial tyre factory. 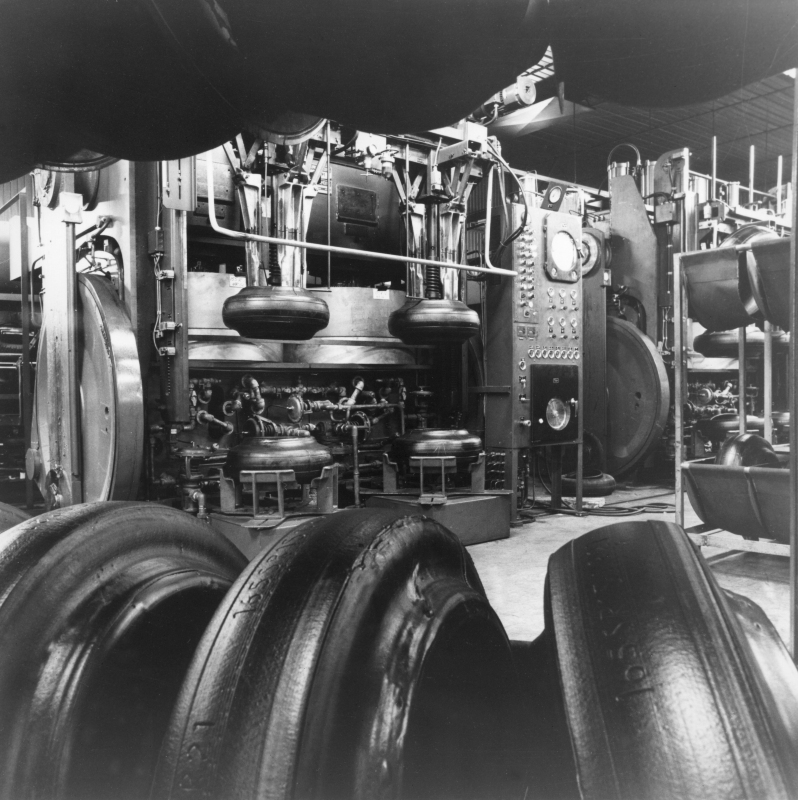 Autoform presses in the background. 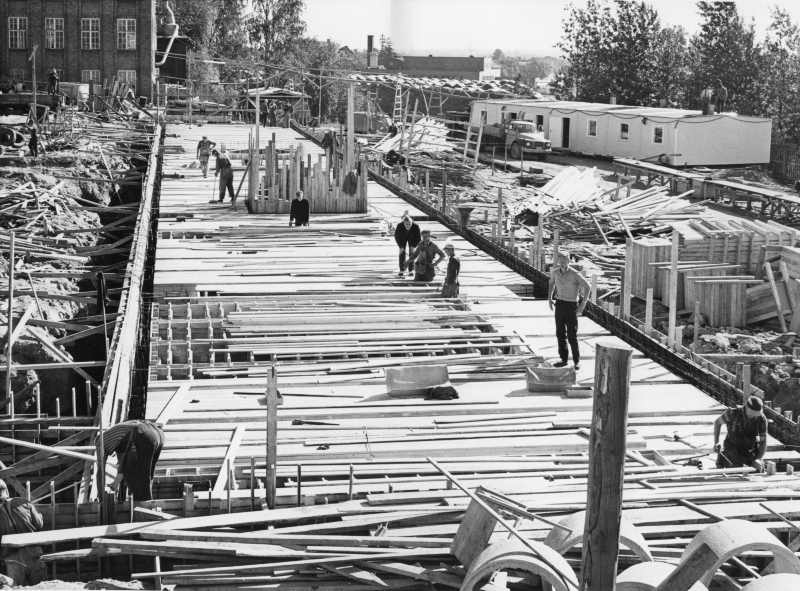 New factory building under construction on the Nokia Kumiteollisuus plot in the summer of 1967. 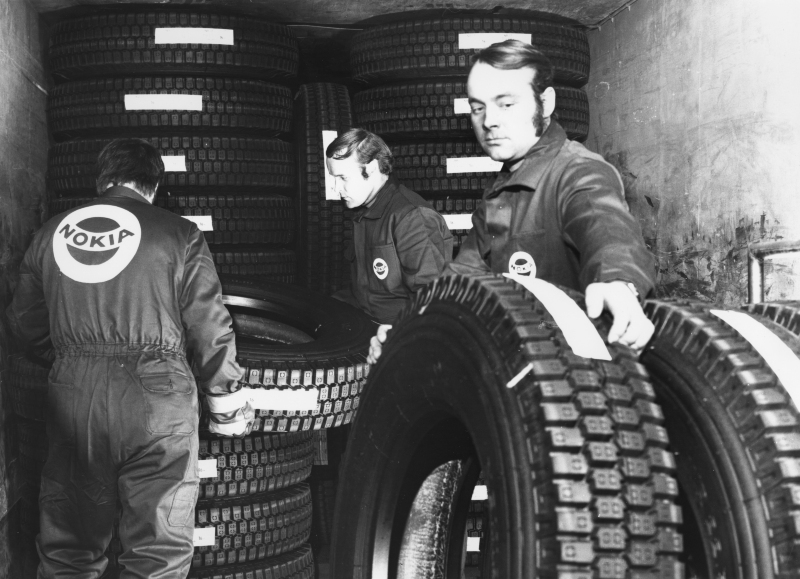 Lorry tyres being loaded for North America in 1967. 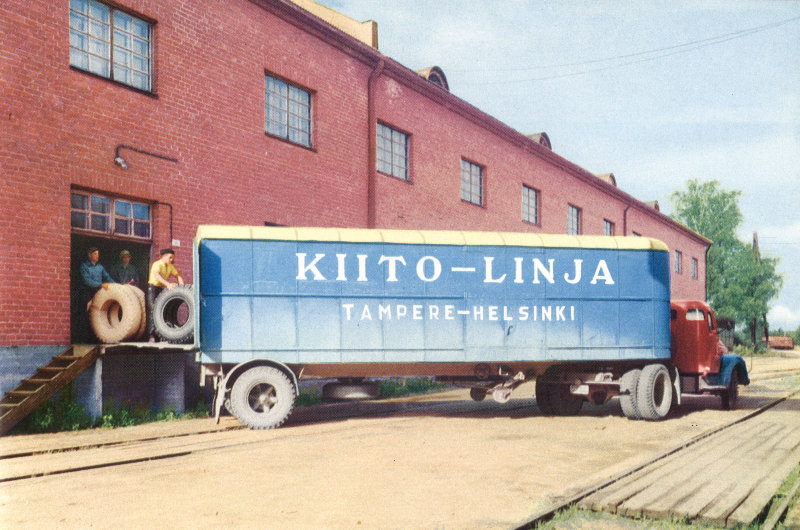 Tyres start their journey to the retailers, carried by the Kiitolinja transport company. 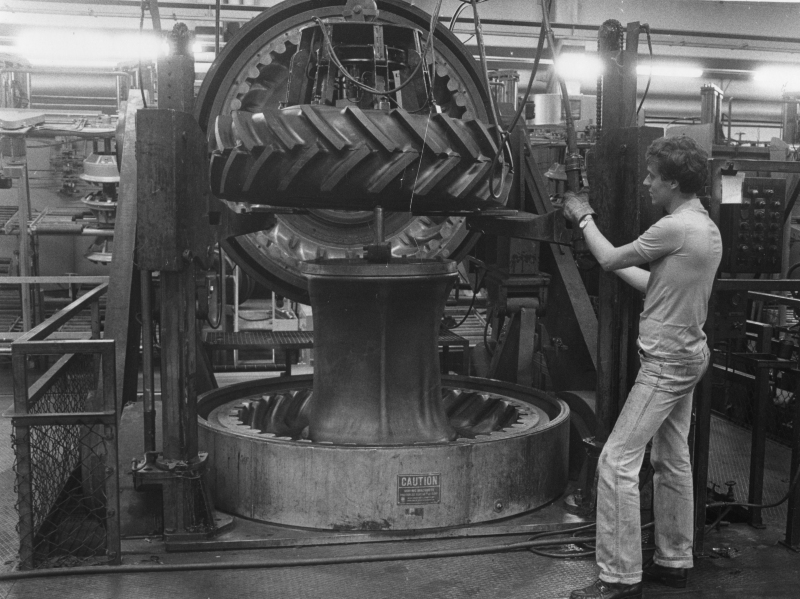 Tyre assembly using an assembly machine. Shoulder cables waiting on the side. 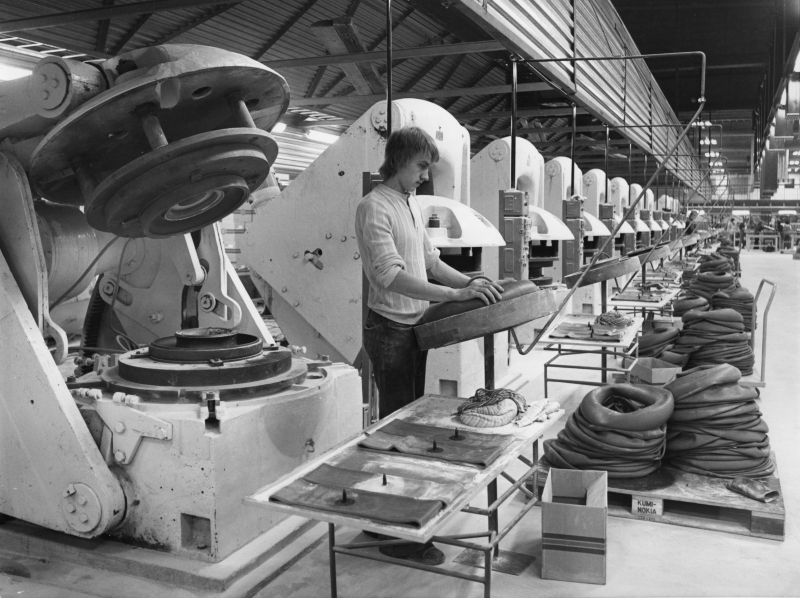 Curing presses for inner tubes at the Lieksa factory in 1975. 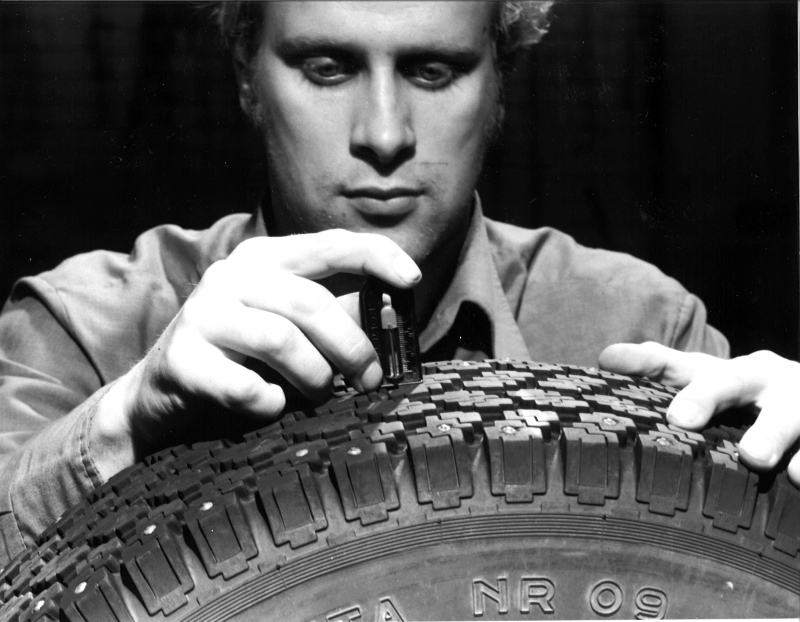 Heavy tractor tyres were a key export in the 1970s. 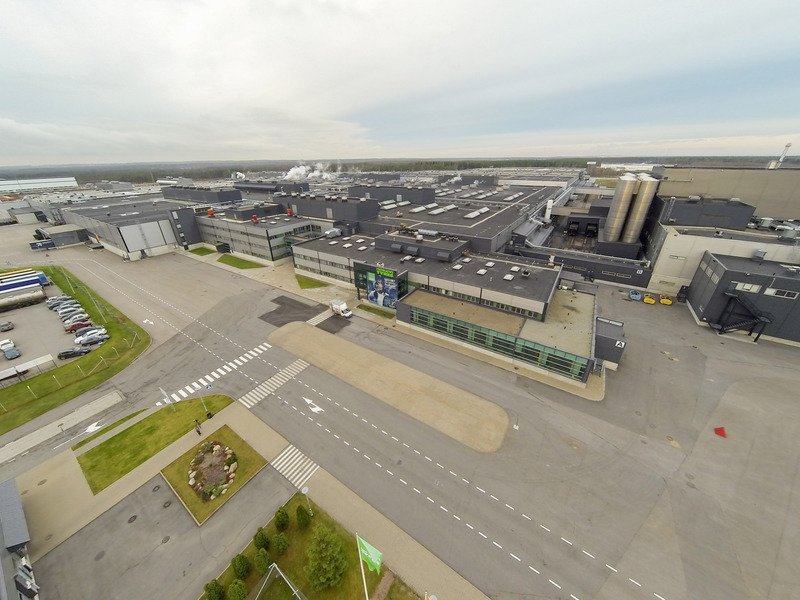 An R&D agreement with the Sumitomo group created close co-operation between Nokia and Japan. Five million 09s out the oven! 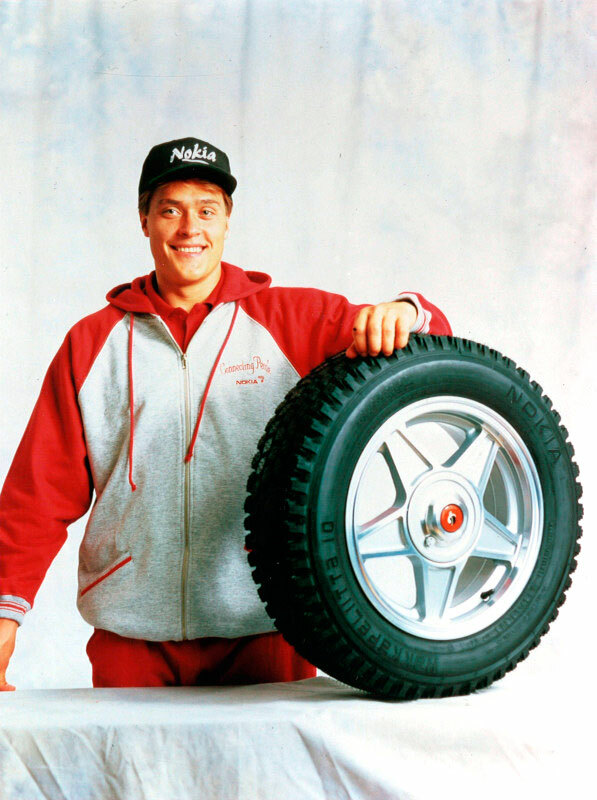 The factory celebrated five million Hakkapeliitta NR 09s in October 1987. 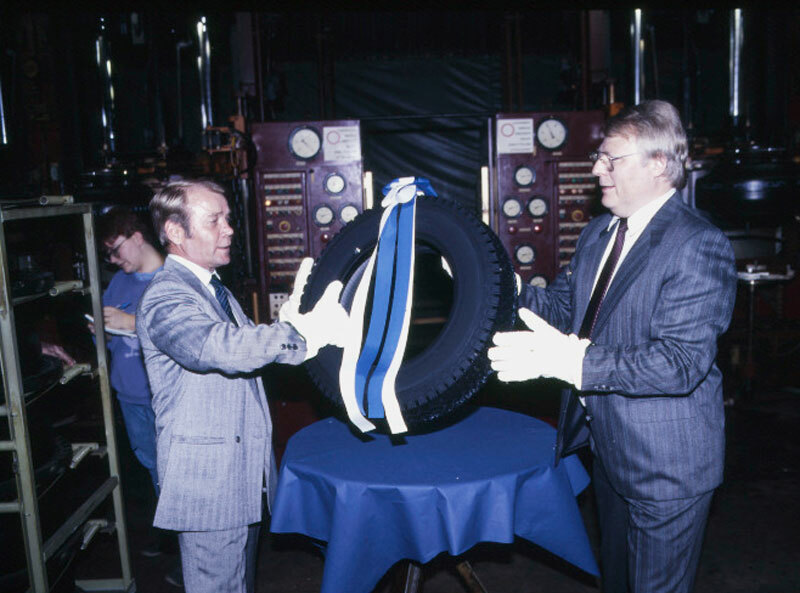 Tyre manufacturing had started in 1979. A man and his studs. 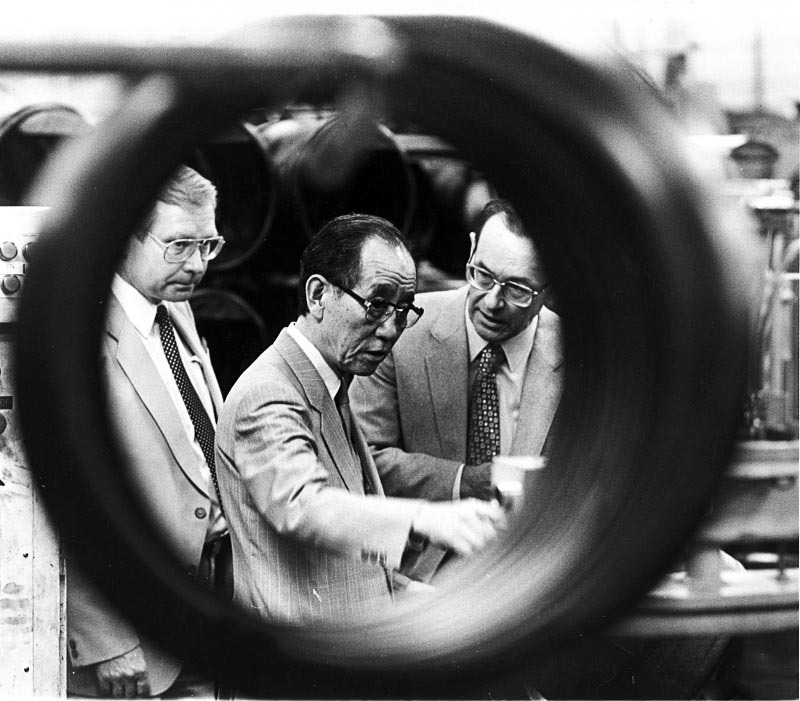 Stud inspection in the 1980s. 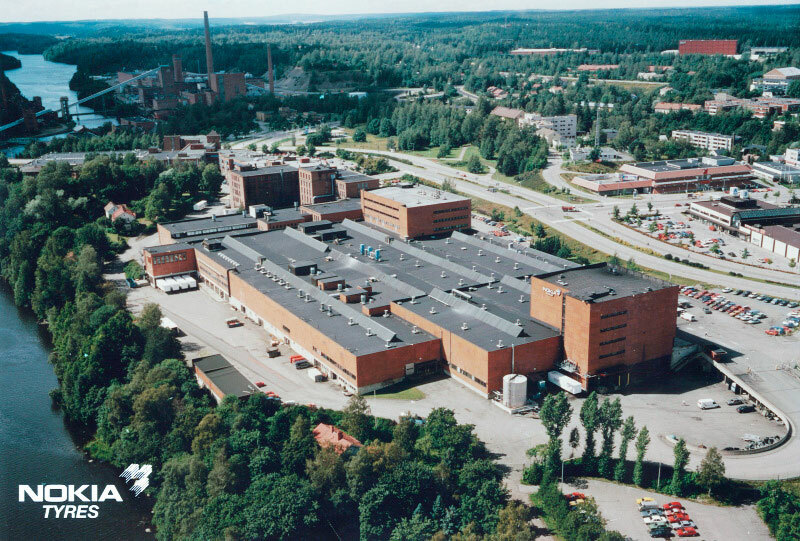 Nokia factory in the summer of 1994. Celebrating inauguration. President of Finland Tarja Halonen, representative of the Russian Federation's president Ilya Klebanov, and Managing Director Kim Gran from Nokian Tyres. Launching a new product in Ivalo. 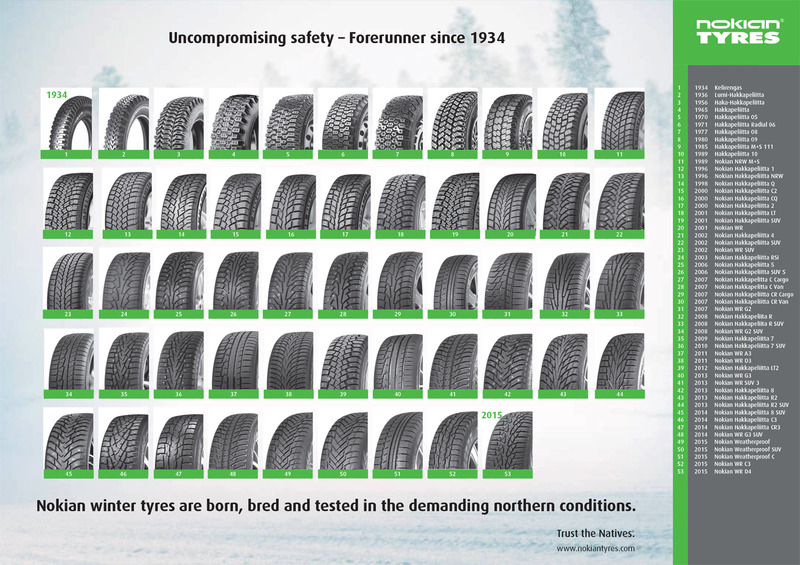 The company's core products are winter tyres for passenger cars and forestry machine tyres. 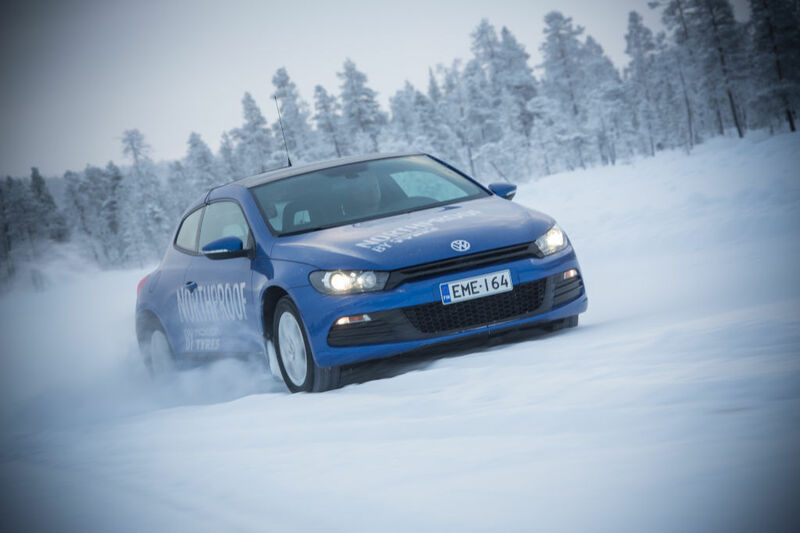 The new world record for driving on ice was made when test driver Janne Laitinen drove at a speed of 331.610 kilometres per hour (206.05 mph) on the ice of the Gulf of Bothnia, near Oulu. The testing of winter tyres is focused on the company's own, unique testing centre in Ivalo. 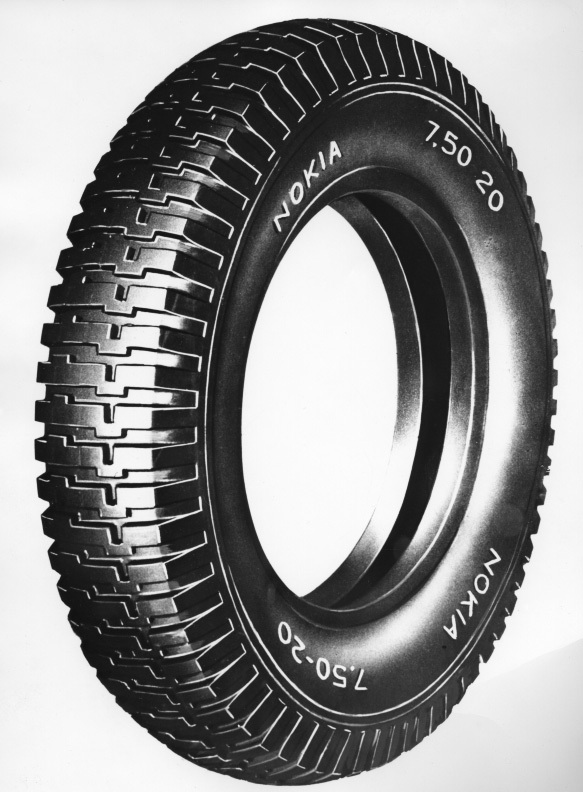 Nokian winter tyres from 1932 to 2016. 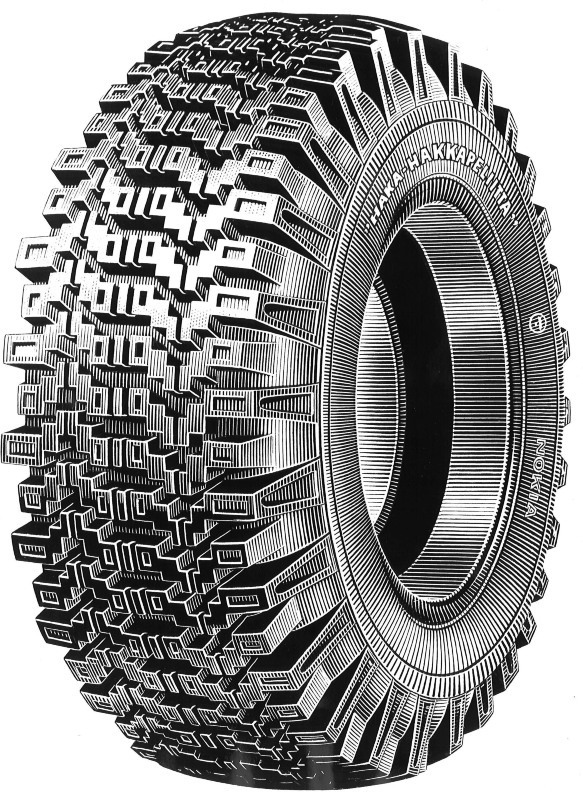 Pushing and exceeding grip limits serve for demanding product development, the main goal of which is safety. 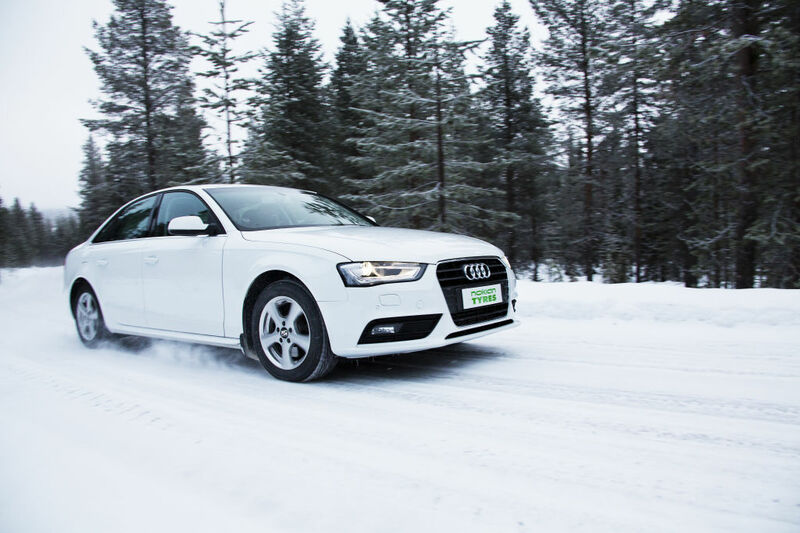 Nokian Tyres winter tyre testing.